A good set of post hole diggers can go a long way in helping you achieve the yard of your dreams. If you’re looking to set a fence, place a sign, plant some flora, or anything else that requires a hole in the ground, you’re in the right place. These tools seem pretty simple, but there’s a lot of variation between post hole diggers that can go a long way: the blade, the handles, and some even have an included ruler. We’ve broken down all the features to help you find the best post hole digger for your situation. Let’s get started with our top pick. Fiskars is a company known for its tough stuff. Their commitment to durability shows in their post hole digger. Fiskars sharpens the blades on their post hole digger before shipping so that you can be sure the blades will cut through the ground. The blades also have a slight taper to help you out when you’re trying to get through tough dirt, clay, tree roots, or rocks. One thing you will notice about this post hole digger is that the handles flare outward. This flaring outward gives you more power when digging and helps to make sure that your hands don’t slide further and further down the digger while you’re working. The outward flare to the handles will also help if you’re digging a hole that’s on the deeper side. We discuss this down in the Frequently Asked Questions section, but there is a max limit to most post hole diggers of about 4 feet. At this depth, the handles begin to get in your way and prevent you from having enough leverage to pull the dirt out of the hole. Fiskars’s flared out handles will help you to maintain your leverage and center of gravity while digging holes. You should be able to use enough power to continue digging to about 5 feet, a significant advantage over other diggers. Fiskars doesn’t do anything that will fizzle out on you after a few uses: this post hole digger is made of solid metal through and through. The metal will make this post hole digger last longer without fracturing like wood or bending like other fiberglass options. It’s why this digger comes with a lifetime warranty. This is a great all around digger. It is guaranteed to last you a long, long time but lacks a few of the bells and whistles. This digger has a blade that is tapered a bit, just like some of the other options on this list. It would be nice to carry a point, but the slight taper is good enough. The handles on this one are pretty standard, but the grips have been extra cushioned for more comfort. There are no features here to make sure that your hands won’t slip or to provide you with more power, though. The handles touch, so you can be sure that the knuckles in your thumbs will whack each other pretty good if you aren’t paying attention. This digger has a unique feature: it comes with a ruler. A ruler isn’t a make or break feature and anyone who has ever set a few posts knows that if you get one post too deep, raising it is a lot easier than lowering it. That said, a ruler is a lot of help when planting plants or trying to get your measurements exact, so this is a great feature that we feel should be seen in more options. The manufacturer’s website says that this digger comes with a 15-year warranty. If you’re looking for a little lightweight work out in the yard or you want to be very precise with your holes, this is the post hole digger we recommend for you. The Seymour Hercules was designed to withstand a lot of the stress and pressure that more commercial or professional use would require. The blades on this one do have a slight taper to a point, but it’s nothing too dramatic. These blades will help you push through the ground to get to the depth you want. The handles on this digger are common to most post hole diggers: there is a foam pad included for comfort, but the handles won’t prevent your hands from sliding, won’t provide you with much extra power, and won’t prevent your hands from touching one another. One big perk to this digger is the reinforcement near the head. A fiberglass insert is included to anchor in the digger’s connection with the blades. These connection points between blades and handles are often the biggest points of stress, so a little bit of reinforcement here goes a long way towards making sure that this digger will last. That said, we were unable to find any warranty information on either Amazon nor the manufacturer’s website. This option is a good pick if you need a post hole digger for professional work or if you have ruined a few post hole digger heads in the past. This one was made for heavy-duty force. The Bully Tools post hole digger is a gem compared to many options on the market but is lacking in features compared to others on this list. The blades themselves come with a bit of a taper and are made of extra-thick 14 gauge steel to last you through all the seasons. 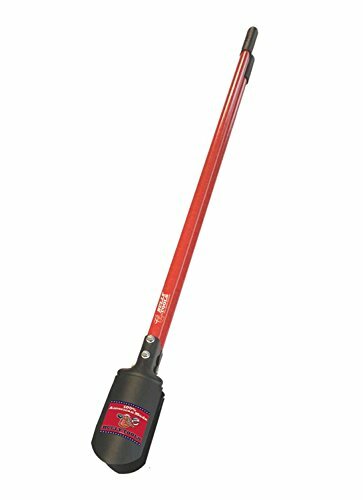 The handles for the Bully Tools digger aren’t too special: they don’t have any features to help with grip or power, aren’t extra thick to provide more comfort, and your knuckles may just start bruising after the third unintentional collision. These handles are made of fiberglass reinforced with wood to prevent bending, so these were built to endure. We’ve mentioned that this digger was built to last and Bully Tools wants to prove it: their digger comes with a lifetime warranty. This is a good tool to grab if you’re looking for something that you know will last you for the long haul, but it misses out on features that really make a digger shine. One of the distinguishing features in the post hole diggers we looked at above were the blades. Some had a pointed blade, others had a sharpened one, some had tapered blades, and others didn’t offer anything that was too special. It’s worth taking a look at the differences in all of these options. In general, the sharper and more pointed your blade is, the faster you will cut through the ground and the easier it will be to make the hole that you need. Pointed or sharpened blades will not detract from any amount of dirt you can carry. A sharp or pointed blade will also be a huge benefit if you begin getting into any roots or rocks in the ground. Sharp, pointed blades will cut through roots and will either break or push rocks out of the way a lot easier than a dull blade. While it’s not a make-or-break feature, sharpened, pointed, or tapered blades are an indicator of quality. You may spend a bit more money buying a post hole digger with one of these blades, but you will find that you are spending a lot less time and a lot less effort digging in the long run. Like blades, there is a range of quality when it comes to the grips of any post hole digger you’re looking at. The lowest quality grips will be straight and made of only wood or fiberglass. The higher quality grips will have a combination of wood and fiberglass or are made of metal and will flex out to give you more stability and power when digging. It’s worth looking out to make sure that your digger doesn’t have grips made of just wood or just fiberglass. The fiberglass grips tend to bend when subjected to too much force and the wood grips can fracture and splinter, leaving you with an unpleasant surprise. If you see a post hole digger with grips that are flexed outward, that is without a doubt a higher quality grip. These flexed grips will allow you to use more force when pushing the digger into the ground and will prevent your hands from sliding too far down. Flexed grips are also nice because you won’t have to worry about your knuckles hitting each other. These grips can save you many a gripe and many a bruise. Is a Post Hole Digger the Right Tool For This? If you fall into one of the categories above, a post hole digger is a great option for you. They are not great options if you need to dig in an area that is very wide or where the ground is very tough. While the post hole diggers above cut through the toughest of dirt or clay, you will almost always be better off getting a shovel if your ground could be mistaken for a block of concrete. Shovels tend to be better for harder ground since you can put all of your weight behind one. Stepping on the shovel blade allows you to dig deeper in the ground than just using your arms and shoulders to power through as you would with a post hole digger. No fear if you think a shovel is a better option. We’ve already reviewed some of the best. What’s the best way to use a post hole digger? Grip the post hole digger with both hands and shove it into the ground. There’s not much form involved, but here’s a video if you still aren’t sure. What is the depth capacity of a post hole digger? For most post hole diggers, you’ll be doing good to get about 4 feet out of them. Any deeper and it becomes difficult to have a good grip on the handles and can be a strain to pull the dirt out of the ground. If you get a post hole digger with a tapered handle, you can expect a max depth of about 5 feet since your hands have more space and you have a bit more leverage with the holes. Depth capacity may be limited by your height if you’re around five feet tall. If you’re much taller than five feet, you should be fine. How can I sharpen my post hole digger? Sharpening your post hole digger is a great idea if you notice that it shipped dull or that it’s not cutting through the ground like it used to. You can use a regular file, whetstone, or electrical file to sharpen the edge. If you do opt to sharpen your digger, it’s best to only sharpen the inside of the blade and not the outside. Sharpening both edges could cause your blade to chip when you hit the ground. This is a very large possibility if you hit any rocks or roots. Here’s a video with more details. The AMES Company started all the way back in 1774 when Captain John Ames began making some of America’s first shovels. Since then, the AMES company has worked on improving its supplies and making it easier than ever to construct the yard of your dreams. Fiskars was founded all the way back in 1649 (and no, that’s not a typo). Fiskars started as an ironworks shop in a Finnish village of the same name. Since then, they have expanded their product line to make it easier for people to do the things they love. Seymour is a family owned tool manufacturer of hand tools made for those who will use them every day. Seymour’s tools are tough and they want to make sure that their wares won’t give out on you. They’re committed to the promise of durability. Despite the name, the people over at Bully Tools are some really nice folks. They’re proud to say that all of their tools are made in America. Bully Tools wants to be reliable in the quality of their products and in supplying what the customer wants, so this is a group that will make sure that you are happy. Thanks for reading our guide on the best post hole digger! When it comes down to it, the best option for you is going to be the one that suits your unique needs best. You may want to take a look at the kind of ground you’re going to be digging in. Is it soft, hard, nothing but clay? For rougher and tougher grounds, you may want to consider buying a tool with a blade designed to cut through the earth or a digger with a long warranty. Ask yourself how much you’re going to be using your post hole digger. Any tool will give out on you when given enough time and usage, so it’s never a bad idea to get a tool with a long warranty (a lifetime warranty is even better). And don’t forget to think about how deep you’re going to be digging your holes. If you’re going to be setting fence posts, you’ll be going a few feet. It may be worth considering investing in a digger with separated handles. These flared out handles will increase your comfort, boost your power, and will help you have better leverage when you’re lifting the dirt out of those deeper holes. Our overall top pick is the Fiskars, but when all is said and done, the best post hole digger for your needs will be the one that can fit your unique situation. There are some good options here for everyone, so don’t be afraid to be a little picky and take your time looking around at which one is best for you.